To see what I have already done, Part 5. It has links to the earlier parts. Generally, I don't think I am finding any unusual improvement in his performance at older ages. Yes, he has had some very good seasons when he was older, but in relation to his performance at younger ages or even immediately preceding seasons, I don't think there is anything unprecedented going on. In some cases I took park effects and league averages into account. Sometimes I also relied only on pitcher determined stats like strikeouts, walks and HRs. Here I do something similar to an earlier part. I only look at ERA relative to the league average and how that stat at an older age compares to a younger age. So I found all the pitchers who had 1500+ IP before the age of 35 who also had 500+ IP from age 35-38. 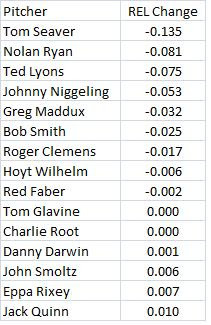 Then I ranked them according to their change in ERA relative to the league average from best to worst. The number 1 guy was Randy Johnson. Under the age of 35, his ERA was 3.36 while the league average was 4.32. 3.36/4.32 = .778. Then 1/.778 = 1.29. So Johnson was 29% better than average at the younger age. From 36-39, his ERA was 2.48 while the league average was 4.42. 2.48/4.42 = .56. 1/.56 = 1.78. So he was 78% better at the older age. Since 1.78/1.29 = 1.38. we can say that Johnson improved by 38%, relative to the league average, moving from the younger age to the older age. 3 other pitchers improved by 20% or more. 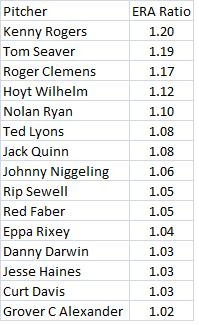 Clemens was actually about 7.7% worse at the older average. Of the 101 pitchers in this group, Clemens ranked 58th. I also used an under age 36 and ages 36 to 39 comparison. This time, Dennis Martinez improved the most, by 28%. 5 other pitchers improved by 20% or more. Clemens was about 19% worse, ranking him 77th out of the 83 pitchers. I also did ages 37-40 compared to under 37. The biggest improver was Clarence Mitchell, who did 33% better. 5 other pitchers improved by 20% or more. Clemens was about 18% worse, ranking him 81st out of the 88 pitchers. So Clemens does not appear to have found some unprecedented fountain of youth in his late 30s. I know I did not take park effects into account here or pitcher determined stats or number of IP. But Clemens is so far down on these rankings that it is very unlikely that bringing these things in would show something unusual. Clemens did have some great years after age 39, but I dealt with that in the first part of this series. I think this will be the last part of it and next weekend I will probably have something on a different topic. Recall that Clemens age 44 was included even though he had only 99 IP. All other 44 years olds had well over 100. Clemens had the 3rd best improvement. That gave him 18 points. Take that away, and he falls into a tie with Cy Young. But his performance here is still pretty good. Clemens was in the top 20 six times for improvement. Now strikeout-to-walk ratio relative to the league average. Clemens is only 5th here and this stat is controlled by the pitcher, whereas runs are also affected by the fielders. Also, Clemens got 17 points here for age 44. Take that away and his point total drops to 41 and he ranks 10th at best. Now for wins above replacement level. 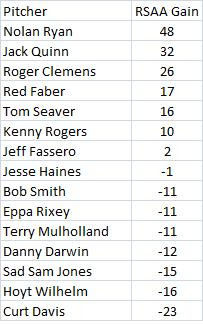 Although he is number 1 here, if I kept to the 100 IP level, Clemens would lose his 20 points and fall to 74 or 3rd place. UPDATE Feb. 25: The graph below shows strikeouts per 9 IP relative to the league average. Notice that age 35 is not his best year. He had two years at much younger ages that were better. Then there is another graph that shows Cy Young. 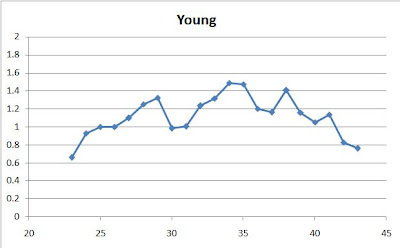 Now the graph for Young, same stat. He has some spikes late in his career. So somehow he became a much better strikeout pitcher in his later years. He did switch to the AL in 1901 at age 34 (his career best ratio of 1.49) and maybe the AL was inferior to the NL, so that was the reason for the improvement. But he was already trending upward and he had what was his second best season (up to that time) at age 33 (a ratio of 1.31) nearly as good as his best ratio of 1.32 at age 29 and alot better than anything before age 29. But he also was trending down then had another spike up at age 38 (1.40) which was much better than what he had at age 36 (1.20) or 37 (1.16). To see what I have already done, click on Part 1 and Part 2 and Part 3. So far, I have not found that in his late thirties or early 40s that Clemens had an unprecedented improvement. Early 40s was good, but not the best. Late 30s was not good, with many pitchers doing better than he did. I have looked at many stats, sometimes adjusting for park effects and league averages. Pitchers that show more improvement than Clemens include Nolan Ryan and Dennis Martinez. In this post, I simply show that both Ted Lyons and Cy Young also either showed significant improvement late in their careers or did unusually well. In the graphs below (the last thing), the pink line is strikeout-to-walk ratio (not adjusted for the league average. The blue line is ERA+ (from Baseball Reference). It adjusts ERA for the league average and park effects. A 120 means the pitcher is 20% better than average. But I divided the ERA+'s for each guy by 100 to fit in the graph. So 120 would become1.20. To give you an idea of what I found, when Cy Young was 39, his ERA+ was 86. When he was 40, it was 129. So it went up 50%. When he was 41, it was 194. so it went up 50% again. When Clemens was 40, his ERA+ was 112. When he was 41, it was 146. So it went up 30%. When he was 42, it was 226. So it went up 55%. Those two events look very similar. Just one year difference in age. Cy improved even more over the two years than Clemens. Young also had a big spike up in ERA+ at 34. He pitched 180 innings at age 41 in 1942. Even in 1942, most of the good hitters had still not joined the military (Williams and DiMaggio, for example were still there). Lyons had a career ERA+ of 118. So in his late 30s and early 40s, he was generally pitching well above his career average. My point is that late career improvements are not totally unheard of (although not common). Notice his strikeout-to-walk ratio more than doubled late in his career. I am not sure what Clemens has done in terms of an unusual age profile is much different than Lyons or Young. Now the graphs. Age is on the horizontal axis and strikeout-to-walk ratio & ERA+ are on the vertical. To see what I have already done, click on Part 1 and Part 2. 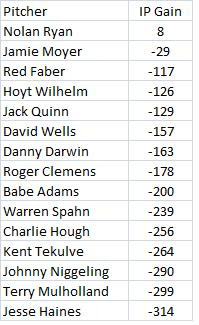 I looked at how well Clemens did from ages 40-44 compared to how he did from 35-39.So far, I don't think I have found anything so unusual that it raises suspicions. What I do here in Part 3 is to look at all the pitchers who had 1500+ IP under age 36 and also had 500+ IP from 36-39 (83 pitchers). This is something I actually did last August in response to a question someone asked me about Randy Johnson. Then I found their ERA relative to the league average when both old and young. You can see that Dennis Martinez is first. Under 36, his career ERA was 3.82 while the league average was 3.89. He was 2% better than average. So that is why he has a 102 for under 36. From 36-39, his ERA was 3.03 while the league average was 3.97. He was 31% better than average. That is why he as a 131 for the 36-39 column. Then 131/102 = 1.284. He was 28.4% better at the older age than he was at the younger age. This was the biggest improvement. Clemens is ranked 76th. His under 36 ratio was 146 (meaning he was 46% better than average under the age of 36. From 36-39 he has a 117 (he was 17% better than average). So 117/146 = .801. From 36-39, Clemens was 80.1% as good as he was under 36. I need to look at more things like strikeouts, walks, HRs, fielding independent ERA, use park effects, find win values over the replacement pithcer, etc., like I did in parts 1 and 2. Also, the age profile is slightly different here. Maybe I can post that this weekend. How Well Has Roger Clemens Aged? I also wrote a couple of articles called "Did Roger Clemens Have the Best Age-Adjusted Season Ever in 2005?" (parts 1 and 2) a couple of years ago. You can read them here and here. First, let's see who the best pitchers were past the age of 39. 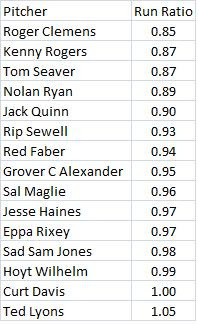 The following table shows the top 15 pitchers with 200+ IP. 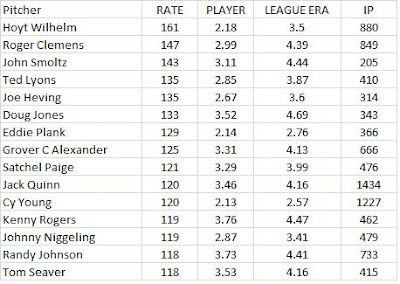 The 161 for Wilhelm means that he was 61% better than the average pitcher in ERA. Clemens is near the top. Wilhelm was a knuckleballer. Smoltz does not have that many IP. Lyons and Hevving were old during WW II. So Clemens really stands out. The next table shows the increase or decrease in ERA relative to the league average going from the ages 35-39 to 40-44. Rogers had a 99 from 35-39, meaning he was 1% worse than average. He had a 119 when he was 40-44, meaning he was 19% better than average. Then 119/99 = 1.20. So taking the league average into account, Rogers was 20% better at the older age. Of course, Clemens is up there and has alot more IP than Rogers or Seaver. The next table shows how much they increased or decreased in SO/BB ratio. Ryan has 30% at the older age. His SO/BB ratio was 2.25 at the younger age while the league average was 1.72. 2.25/1.72 = 1.30. So he was 30% better than average in the younger years. But he was 70% better than average during the older years. His SO/BB ratio was 2.95 while the league average was 1.74 (2.95/1.74 = 1.70). 1.70/1.30 = 1.30. That is why Ryan is 1st below at 1.30. Clemens does make the top 15. He was 5% better. The next table shows the change in allowing HRs. In the younger years, Seaver gave up 93 HRs while an average pitcher would have given up 72. So Seaver gave up 29% more HRs (93/72 = 1.29). In the older years he gave up 39 while the average was 46. He gave up 15% fewer HRs than average (39/46 = .85). Since .85/1.29 = .66, Seaver's rate of giving up HRs at the older rate was just 66% that of his younger rate. Clemens also made the top 15 here. 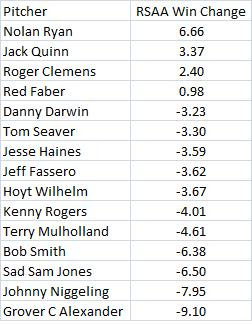 The next table shows how many runs per 9 IP each pitcher gave up in the older years relative to his younger years. 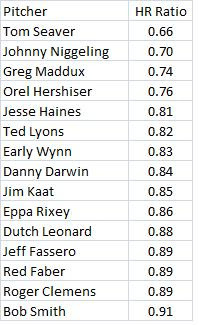 For this, I used a stat from the Lee Sinins Sabermetric Encyclopedia called RSAA which shows how many fewer runs a guy allowed than the average pitcher while adjusting for park effects. I first adjusted each guy to a league with 4 runs per 9 IP. Clemens has 3.10 runs per 9 IP at the younger age and 2.63 at the older age. 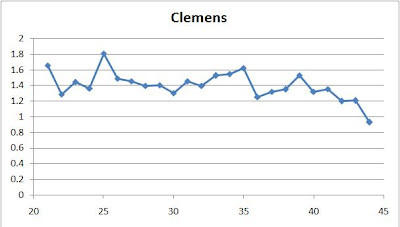 Since 2.63/3.10 = .85, Clemens only gave up 85% as many runs at the older age than he did at the younger age. 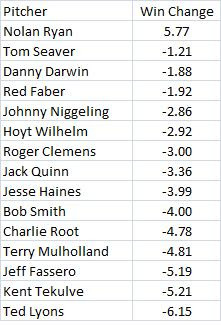 The next table simply shows how the best pitchers in terms of how many more or fewer runs they saved at the older age compared to the younger age. Ryan gave up 21 fewer runs than average (park adjusted) at the younger age but 69 fewer at the older age. So he improved by 48. 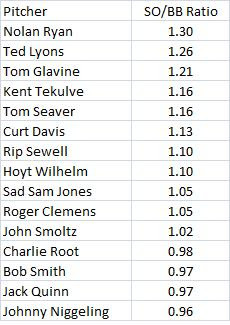 Very few guys saved more runs at the older age. Clemens does well here, too. The last table just shows the leaders in terms of change in IP. Ryan was actually the only one to pitch more innings. There may be others who did, but they don't meet the qualifications I set out at the beginning.